He Is Not Here | ". . . let God be found true, though every man be found a liar." When Mary Magdalene and the other Mary came to the Lord’s tomb early on the morning of the first day of the week (Mt. 28:1), they found the stone rolled away and the tomb open. In Mark’s account of this event (Mk. 16:3), he points out that the women were discussing who they might get to roll the stone away when they arrived at the tomb and found the open grave. In Matthew’s record, he tells us that a severe earthquake occurred and an angle of the Lord rolled the stone away while the Roman soldiers fainted in fear (Mt. 28:2-4). When the women arrived at the tomb an angel spoke to them and said, “Do not be afraid, for I know that you are looking for Jesus who has been crucified. He is not here, for He has risen, just as He said. Come, see the place where He was lying” (vs. 5-6). Christians recognize these words as a description of the central feature of our faith: the resurrection of our Lord and Savior Jesus Christ. Skeptics, of course, take a different view, often making fun of this statement of scripture by suggesting that the angel was actually trying to direct the women to the correct location of the Lord’s body. Even a cursory reading of these verses shows how ridiculous such an assertion is. The risen and exalted Savior was the basis for the preaching done by the apostles on the first day of Pentecost after the Lord’s resurrection. The truth or falsity of their proclamation could easily have been proven at the very moment they spoke. In Acts 2:32 Peter said, “This Jesus God raised up again, to which we are all witnesses.” If this statement were not true, all anyone would need to do in order to shame the apostles into silence was to direct the crowds to the tomb and show them the body. It is not surprising that no one challenged Peter’s claim, because the rulers of the Jews knew the truth. In Mt. 28:11 the scripture tells us that the Roman guards told them exactly what had happened. 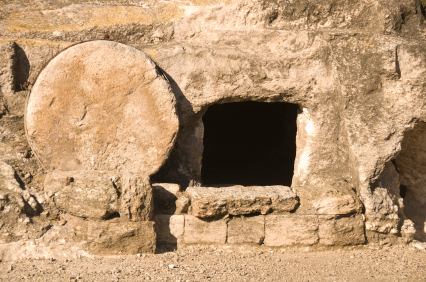 “He is not here” is the declaration that Jesus was no longer in the tomb. Death was unable to hold Him, as it had done all others before Him. “He is not here” is the clarion call to all of honest heart to believe all that Jesus taught during His earthly ministry. It is a call to believe all that His apostles taught as they established and led the Lord’s church thereafter. “He is not here” declared that the Lord was alive and would soon be exalted to the right hand of God to reign until the end of time. “He is not here” is the assurance that the Lord would be with His people always, even to the end of the age, just as He promised (Mt. 28:20). There were others who had been resurrected before the Lord was. He Himself had performed such miracles on several occasions. No one, however, had ever been raised as He was. In Rom. 6:9 Paul said, “Christ, having been raised from the dead, is never to die again.” Because “He is not here” in the tomb, He ever lives to intercede on our behalf before the Father in heaven (Heb. 7:25). And we who belong to Him, those who have been washed in the blood of the Lamb, have hope with regard to our own resurrection, which will come at the end of time. Since our Lord lives, never to die again, we have the promise that we, also, will rise one day, never to die again.